This Vanilla Brownie Pound Cake Loaf is the best of both worlds! 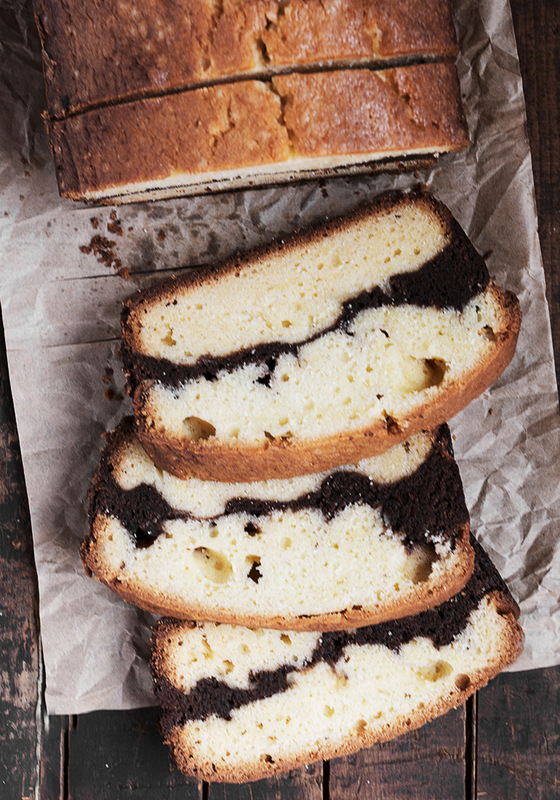 Delicious vanilla pound cake, with a vein of brownie in the middle. 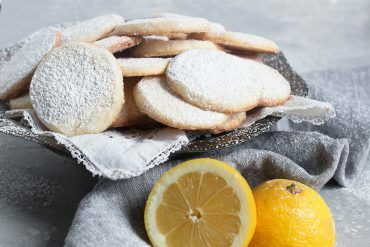 On one particularly cold and snowy day, I was in the mood to bake up something and happened to spot this recipe in Southern Living magazine. 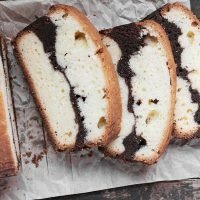 Thankfully, this Vanilla Brownie Pound Cake Loaf needs only regular pantry items, so within a short time, I was enjoying this beautiful loaf! 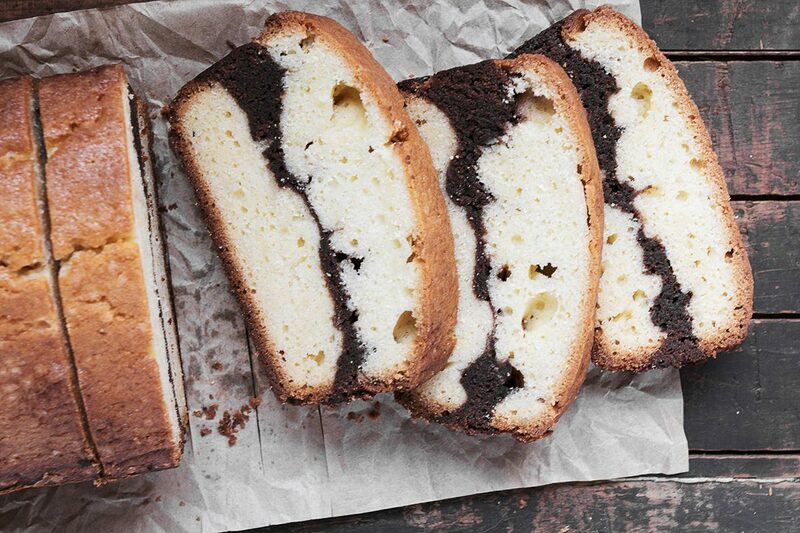 It’s a “best of both worlds” bake, where you don’t have to decide between chocolate and vanilla. You can have them both in one pan. 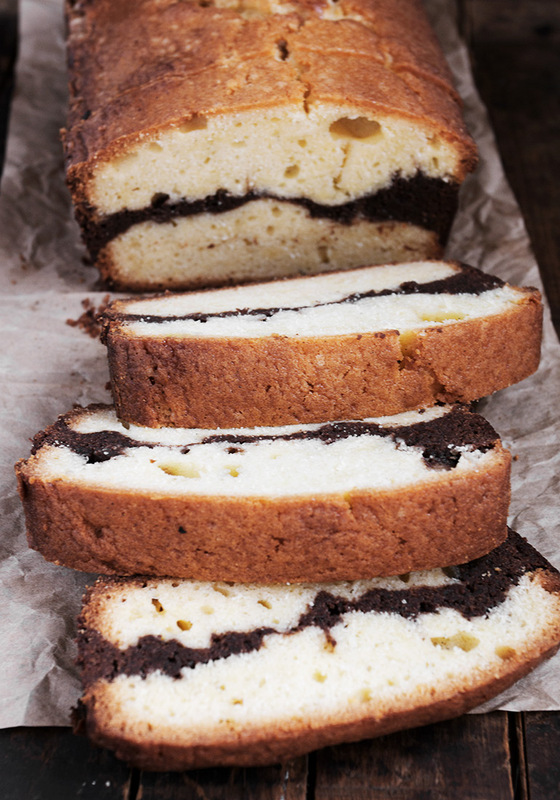 The vanilla pound cake has wonderful flavour and texture, while the vein of brownie is moist and chocolaty. 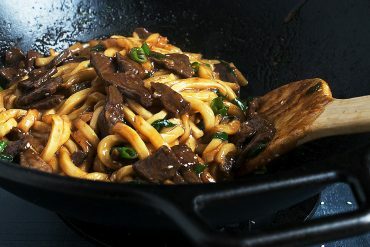 It’s a great combination of different flavours and textures and definitely a winner! This loaf freezes well, so don’t hesitate to freeze any you can eat up right away. Love loaves? I’ve got a few more – like this Glazed Lemon Pound Cake Loaf, this Strawberry Shortcake Loaf and a delicious Cinnamon Crunch Loaf. Delicious Vanilla pound cake loaf, with a vein of brownie in the middle. The best of both worlds! This freezes well. Preheat oven to 325° F. Lightly coat a 9- x 5- x 3-inch loaf pan with cooking spray, then line the bottom and 2 long sides of pan with parchment paper, allowing 2 to 3 inches to extend over sides (to use as handles to remove later). 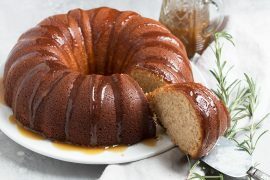 Prepare the Pound Cake Batter: In a medium bowl, whisk together well the flour, baking powder and salt. Set aside. 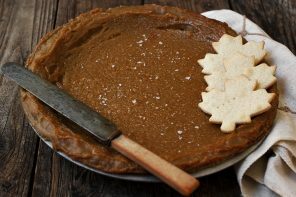 In a large bowl with an electric mixer (or the bowl of a stand mixer with a paddle attachment), beat sugar and butter in a on medium-high speed until light and fluffy, about 4 to 5 minutes. Beat in vanilla bean paste. Add eggs, 1 at a time, beating well after each addition. Beat in sour cream just until smooth. Add flour mixture, one-third at a time, and beat on low speed just until blended after each addition. Spoon half of the Pound Cake Batter into prepared pan. Spoon Brownie Ripple Batter over Pound Cake Batter, covering it completely. Top with remaining Pound Cake Batter. Using a small offset spatula, smooth batter carefully. 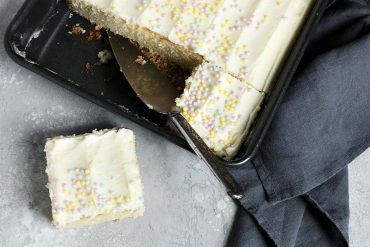 Cool cake in pan on a wire rack 30 minutes. Remove cake from pan using parchment paper as handles, and cool completely on wire rack, about 1 hour. Be sure to let the cake cool completely before slicing, so the brownie layer has a chance to set. Slice and serve. I made this pound cake for Dinner Club last night; we were at a picnic setting so I wanted a dessert that was not messy. I served the slices with fresh cut strawberries. The cake got rave reviews! I made only one change; I used 3 vanilla beans instead of the vanilla paste. I cooked the cake an hour and 40 minutes; I feel it could have been cooked at least 5 minutes less; I did use tin foil over the cake for the last 30 minutes. My only other comment would be that I did not get enough of a chocolate taste but I like chocolate a lot so it could just be me. 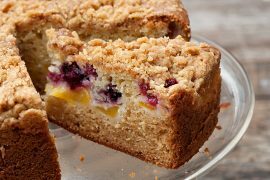 Excellent recipe and easy to make! Can you substitute Whole milk yogurt for Sour Cream? Hi Courtney, I haven’t tried it in this recipe, but I’ve made that substitution in other baking recipes with good success. A thicker, Greek style yogurt probably works best when substituting for sour cream, as it has a similar consistency. Enjoy! I love the combination – a little bit of chocolate and beautiful vanilla cake – the perfect dessert! 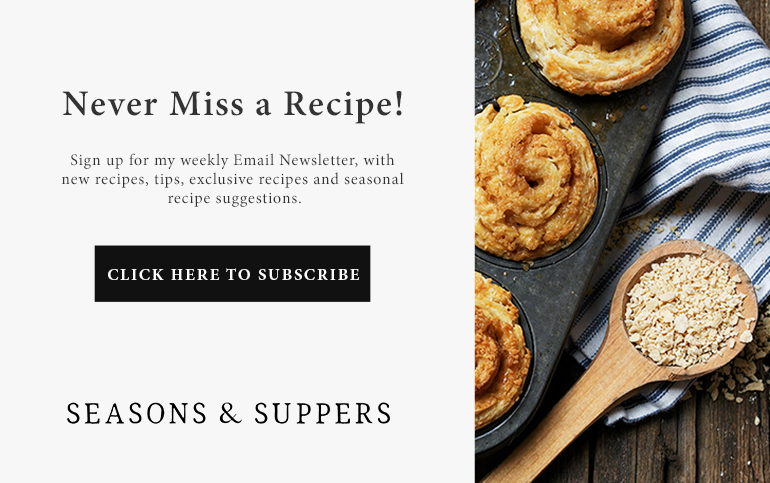 So happy you shared this recipe – so I will too! Jennifer, this may sound a bit naive, but how do you measure butter in tablespoons accurately? Do you scoop it or cut into little pieces to go into the tbsp, or is there a better way? Thanks for the tip. Hi Paula! There are a couple of easy ways to measure out 6 Tbsp. The easiest way I found is to always buy butter in sticks. At least here, the sticks have handy, dandy Tbsp. markings on the foil wrapper, so I can just cut the stick 6 Tbsp along the stick. It’s a little more expensive usually, but handy if you do a lot of baking. Failing that, I usually weigh butter out with my kitchen scale. 1 Tbsp. of butter weighs 1/2-oz, so 6 Tbsp. would be 3 oz. in weight on the scale. One last tip, that doesn’t work so well with 6 Tbsp measures, but works well with 1/2 cup, 3/4 cup, 1 cup etc. So if you needed 1/2 cup butter, you put 1/2 cup water in a liquid measuring cup, then add dollops of butter until the water level in the cup reaches 1 cup. The butter in the measuring cup = 1/2 cup! Of course, your butter is now wet, but it doesn’t hurt it :) Hope that helps! This one’s a win-win Jennifer! Double the flavor, double the fun! This is definitely the best of both worlds. How can you say no to a little vanilla and chocolate swirl action?!? It looks absolutely divine! I love that it freezes well, too. Makes life a little easier sometimes, right? 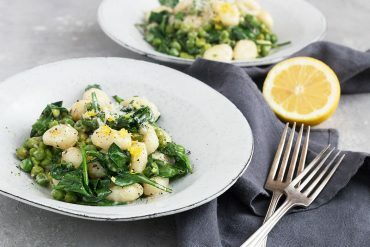 What a delicious recipe for those indecisive eaters like me :) I want a little of everything most of the time, lol. Sounds like the perfect combination and would go so lovely with a nice cup of coffee right about now! This really does look like it has the ideal texture, and it’s so pretty to boot! 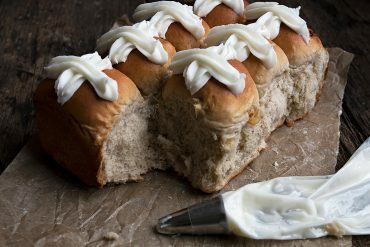 I would love to have a loaf of this in my freezer for last minute desserts, I bet it’s amazing with a scoop of ice cream, yum!! Thanks Sue and yes, this is a great dessert slice! I love this Jennifer. Just the name alone makes me want to bake a loaf of this. It’s also super pretty! Followed the recipe exactly and This came out perfectly. Delicious and divine to look at too! You are a gift 👌❤️ Thank you for sharing this.